So, by now I think everyone knows I am closing my studio in Temecula. (Yes, I am still teaching, at my house, and the online store is staying.) This is a daunting task. Inventory management is not easy for the most seasoned professional, and trying to guesstimate what people will buy at any given time is just not my thing. That being said, I have a *lot* of stuff that I had either guessed too high on, or the class didn’t go, or yada yada yada…it goes on and on. I had a near breakdown yesterday as I reviewed the volume of things I still needed to catalog and update in the system, so that I can offer it to you good folks out there. I’ve slashed prices on a few things (t-shirts and Trim-a-rims) and the discount MAR15 will still get you 15% off till the end of the month. I will issue a new discount code in May, to help me clear more. This has become pretty overwhelming for me. So naturally, I turn to tangling to try to resolve some of those feelings (I also have been meditating daily on top of that.) So I found this week’s Diva Challenge (#357) to do a monotangle of Rick’s Paradox to be quite soothing. Line work. Making lines. Line after line after line. I decided to use my Big White Bee charcoal paper journal for this, and I traced 2 tiles, not really knowing what was going to come out of it. I really liked the one we did during the 12 Days of Zentangle, so I decided to revisit that one, with a bit of a twist. And part of getting through the overwhelm is eating nourishing food. Since Mike is on a trip, I am trying some different recipes. Zucchini and cheese Tacos? They were actually pretty good. But, calming down again got me in the mood to try a ZenButton…I really like this way to use fragments…I am trying a black one next. 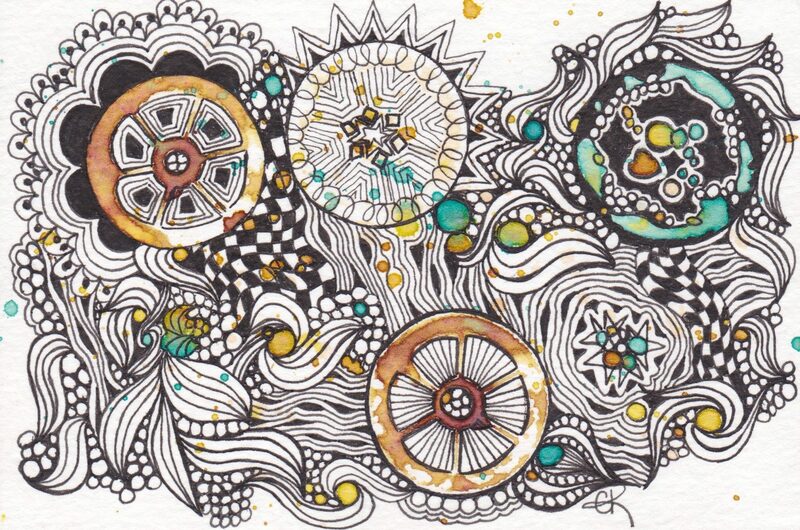 I had another calming day on Saturday, with a small Zentangle 101 class. You can book classes directly by emailing me! So, the game starts in 5 minutes, and that means I have to go! Yep…tide…not tied. Water. Oceans. Rivers. That is what the tangle Verve speaks to me. Movement of water. This week’s Diva Challenge (#355) was to use the tangle Verve. I’m working on samples and a handout for a top secret project, but found this to be just the tangle I needed for this body of water. At this time…I’m not at liberty to discuss what else is going on. But you are gonna love it, I guarantee! At this time, there is only one Ready or Knot kit left in stock, and I have not decided if I am going to restock it or not. In the meantime, hop on over to the store and use code MAR15 for 15% off the rest of this month!